What’s Shakin at This Year’s Race for the Bacon + A Race Entry Giveaway! 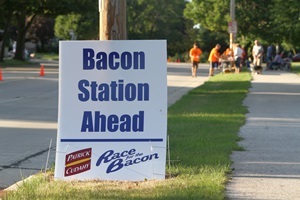 MKE’s Patrick Cudahy Race for the Bacon 5k Run/Walk has turned out to be quite the trend-setter. Bacon races are now popping up all around the country and there’s even a nationwide series of bacon races being started by the company that owns the Warrior Dash. Registration for the 2014 Patrick Cudahy Race for the Bacon 5k Run/Walk is now open. 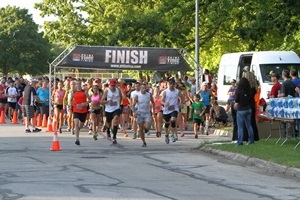 The race will be held Thursday, July 31 at Sheridan Park in Cudahy and will begin at 6:30pm. Following the race, participants can indulge in a huge Bacon Bash featuring lots of bacon-y delights, plenty of beverages and live music in a park setting overlooking Lake Michigan. Last year’s event drew around 900 participants. When the Race for the Bacon started in 2012, it was alone in the “bacon run” category. Then last year came the Great Bacon Race in Vancouver, Washington, and this year will see the addition of the Great American Bacon Race in Miami Beach, Florida, as well as the Bacon Chase series, which is launching in Chicago and Atlanta in 2014, and is set to expand to other cities in 2015 and beyond. The race here has received national attention so it’s not a surprise to anyone that it has attracted imitators. But Ponteri said he is skeptical about the success of a national event like the Bacon Chase. Think you have what it takes to bring home the bacon? Tell us about your favorite bacon treat in the comments section! This entry was posted in Race Previews and tagged Chris Ponteri, Giveaway, Milwaukee Races, Race for the Bacon, Race Previews, Running in MKE, Upcoming Events. Bookmark the permalink. ← Are You Ready to Run Like a Mother? Hands down my favorite bacon treat…jalepenos filled with cream cheese and wrapped on bacon grilled to perfection on the grill! I like Keep Running MKE on facebook. I like Race for the Bacon on Facebook. I follow Keep Running MKE on Twitter. I follow Race for the Bacon on Twitter. I’d love to try this race! One of my recent favorites is bacon with Brussels sprouts. My Favorite Bacon Treat – hands down jalepenos filled with cream cheese and wrapped in bacon grilled to perfection on the grill! my favorite bacon treat–bacon-wrapped water chestnuts! i follow @baconrace on twitter. My favorite bacon treat is just plain ol’ bacon. My favorite bacon treat: Bacon on a Maple Glaze donut! Doesn’t get any better than that! !